Are these genuine HP Photosmart 2575a ink cartridges or refills? We sell both genuine and compatible Photosmart 2575a cartridges. You can easily identify which is which as our compatibles have 'Premium brand recycled ink cartridge' written next to the product image whereas the originals will have 'Genuine HP' and the manufacturer logo to distinguish them. You will also notice that genuine inks come in the official HP packaging. Whether it's business documents or homework, the HP 2575a pulls through with excellent quality printouts. Unavoidably your HP 2575a will polish off its printer ink, and when that does happen you'll quickly work out that ordering HP 2575a ink is normally quite pricey. Thankfully, however, you do not need to get stressed about paying the high asking prices you'll find on the high street because right here at Cartridge Save you can order all the HP 2575 a cartridges you'll ever need at very small prices. Save more money on your ink by shopping at Cartridge Save! You don't need to pay the high cost of a 2575-a original cartridge or 2575a compatible ink down the main street when you could save a bundle of cash ordering with Cartridge Save. You have one hundred per cent confidence when you purchase PhotoSmart 2575a ink cartridges from us because everything is covered by a hassle-free money back guarantee. Be mindful of the fact that every order also has free delivery, mostly delivered to you on the following day! Print photos and documents with or without a PC with the HP Photosmart 2575a, which can copy and print direct from the memory card. This efficient all-in-one printer features Ethernet, a USB port, an optional Bluetooth upgrade, plus Pictbridge technology for direct printing from a camera. With a width of 17.2 inches and a height of 6.7 inches, the HP Photosmart 2575a is a compact machine that packs a lot of features. It has a small colour graphics display to show the menu, photos, and messages. It also features a separate control panel. The HP Photosmart 2575a is easy to use; beginners won't need technical training. The HP Photosmart 2575a boasts a scanning resolution of 2400 x 4800 dpi. It can print as fast as 30 ppm (black) and produces high-quality photos and professional document prints. 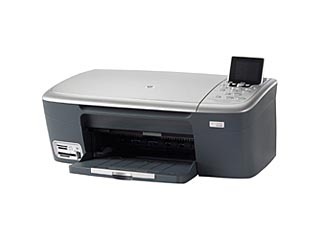 Unlike other comparable models, the HP Photosmart 2575a only needs 2 ink cartridges. It has a duty cycle of 5000 pages per month. The HP Photosmart 2575a is a reliable machine. However, its efficiency suffers when the file size is too large. With proper care and maintenance, the HP Photosmart 2575a should last a long time.